Stepping through the door of this charming shop, one would never believe that the beautiful furniture and accessories on display are pre-owned. At Stonington Consign to Design, every piece has been thoughtfully selected with an eye to attracting discriminating buyers looking for upscale brand names and quality. The space is welcoming, offering collections of pieces arranged in the most pleasing manner to engage a shopper’s vision of their own home. 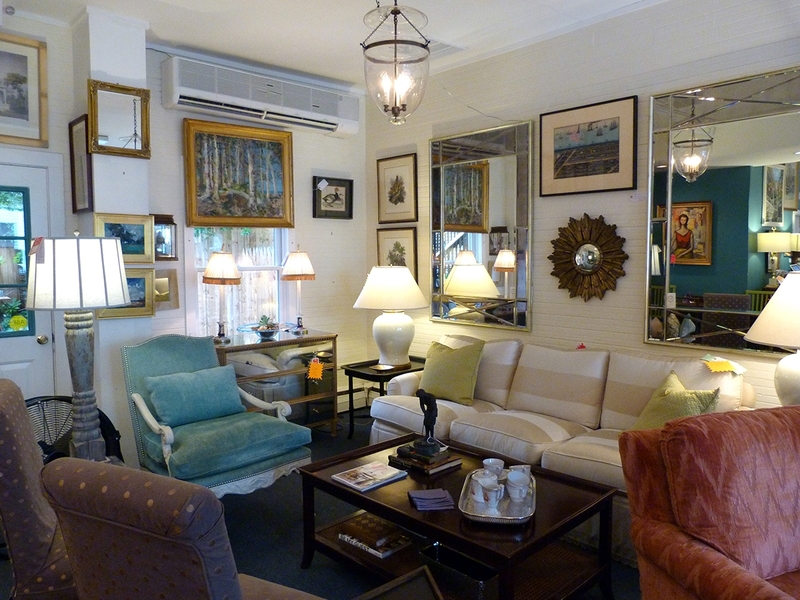 Watson’s partner, Mary Elliott, is a well-known interior designer in New York and Florida as well as Connecticut, and she handles the staging of the shop each week, placing new acquisitions and moving things around to keep the space fresh. When asked why they decided on a consignment venue, Watson doesn’t hesitate. “The trend for Baby Boomers or empty nesters is to downsize and scale back as they move from their family homes to condos or smaller houses. Reality strikes when they realize that they have too much stuff, most of which won’t fit into the new home or lifestyle,” she says. Often, their younger relatives are not interested in or able to accommodate a large china cabinet or Lennox service for 12. The consignment process is actually liberating, according to Watson. Finally finding a home for perfectly good furniture that’s been stored gives consignors a sense of satisfaction. And buyers are thrilled to find high-quality merchandise at affordable prices. At the shop, expert lighting brings out the colors and textures of the pieces on display, and the fine art on the walls. One current offering is a pair of modern chrome chairs with navy blue velvet upholstery—attractively styled and comfortable, they are versatile and would fit beautifully in either a home or professional setting. In a corner near the window, a swivel chair and ottoman by Lee Jofa (an English design house founded in 1823) just beckon one to sit. The fabric is a striking coral velvet weave and would ordinarily sell for more than $2,500 retail. A lucky buyer will be astonished at the asking price here. The care with which Watson and Elliot choose what items to accept for consignment makes this shop stand out. Items considered for consignment include upscale brand-name quality home furnishings in good condition; fine art and sculptures; decorative accessories, carpets, lamps, clocks, mirrors, and in-season outdoor furniture and décor. The process begins with photos which Watson uses to research the items for pricing. Once the items are accepted, they are photographed and featured in marketing, advertising, and promotions on their Facebook and Instagram pages. The consignment period is four months. Commission information is available by contacting Watson. What could be better than finding a good home for a beloved family piece, or finding that perfect piece for your own home. Stonington Consign to Design is located at 109 Water Street, Stonington, CT 06378. For more information, call 203-921-6377 or email stoningtondesign@gmail.com.